A Fun Run to End Breast Cancer! 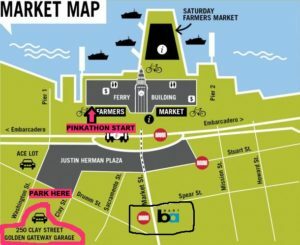 The 2018 Pinkathon San Francisco will take place on SATURDAY morning, October 27, 2018 starting at 6:30 AM at the San Francisco Ferry Building. Meet in front of the Northwest Entrance of the SF Ferry Building by Gott’s Roadside Restaurant. Look for the Pink Balloons! Public Bathrooms and Drinking Fountains are available just inside the Northwest Entrance of the Ferry Building. Recommended distances are 50K, 26.2M, 13.1M, 10M, 10K, 5K and 2Hr Scavenger Hunt. For all distances EXCEPT the 50K and the Scavenger Hunt, the course is out-and-back along the San Francisco waterfront and the Golden Gate Bridge. The 50K includes a LOOP on dirt trails in the Marin Headlands and back to the GG Bridge before heading back to the start. All other distances have a specific turn-around point. We have downloadable Maps and Turn-By-Turn instructions for each distance. Please print out your own maps and instructions before you arrive. We will have a limited number of extra maps and instructions available at Pinkathon Check-in. Since this is an unofficial and un-timed fun-run, you can start anytime you want and run any distance you want. Scavenger Hunt: 8:05 AM We will give instructions and assign people to teams based on preferred distance and speed. Scavenger Hunt Finish: 10:00 AM – All participants must be back at the Start/Finish so we can tabulate team scores. Pinkathon Finish Area Closes at 4:00 PM Sharp. All runners/walkers must be back by then or else we will take your gear bags home with us! *Many thanks to Brian Ladrillono and Michael Li for creating the Pinkathon Course Maps and Descriptions. Sign-in between 6:30 AM-7:30AM. Start time: 8:05 AM. Out-and-back course along the waterfront. Turn-around at the Aquarium. We will mark the turn-around with chalk. Maps are coming. Sign-in between 6:30 AM-7:30AM. Start time: 8:02 AM. Out-and-back course along the waterfront. 10K Course Map & Turn By Turn Directions PDF – Download and Print! Sign-in between 6:30 AM-7:30AM. Start time: 8:01 AM. Out-and-back course along the waterfront. 10M – Turn around at the Warming Hut Cafe at Crissy Field. Water Fountain on the southeast corner of the building. Bathrooms next to the Warming Hut. 10M Course Map & Turn-by-Turn Directions – Download & Print! Sign-in between 6:30 AM-7:30AM. Start time: 8:00 AM. Out-and-back course along the waterfront. Half Marathon Course Map and Turn-by-Turn Directions – Download and Print! Sign-in between 6:30 AM-7:3 0AM. Optional Early Start time: 7:15 AM. You can start earlier or later if you want. Marathon – Turn around about 1.2 miles past the Rodeo Beach Staging Area and bathrooms, where the dirt Coast Trail meets the paved Coastal Trail. Marathon Course Map & Turn-by-Turn Directions – Download & Print! Sign-in between 6:30 AM- 7:30 AM. Optional Early Start Time: 7:15 AM. You can start earlier or later if you want. 50K Course Map & Turn-by-Turn Directions – Download & Print! 50K – This year, we are doing a Clockwise LOOP in the Marin Headlands, with an out and back spur tagged onto the end to Fort Baker and the Travis Marina Bar to get a few extra miles needed to make this a 50K before going back south over the GG bridge and back to the start/finish. Travis Marina Bar (also known as Mike’s Place) is on the 2nd Floor of the Presidio Yacht Club and has bathrooms, water, food for purchase (hotdogs, hamburgers, pizza) and $5 draft beer pints! They will be expecting us! Also FYI, please bring CASH for tips. The Travis Marina Bar bar can accept credit cards to buy drinks, but they can only accept tips by CASH, because this is a bar operated by a Military Base. FYI, there is not a drinking fountain there. Ask for free water at the bar or fill your reservoir in the bathroom sink. Also, there may be a private party or wedding in the downstairs function room and/or outdoors. The Travis Marina Bar is on the 2nd Floor! Please be respectful of the private party. From Travis Marina Bar, it is about 8 miles back to the Start/Finish at Gott’s Roadside at the Ferry Building. Pinkathon volunteers will be there until about 4 pm PST. If you have any emergencies on trail, please call 911 first and then call Ellen at 510-841-1240 to let us know how we can help. This run is FREE. We are poor. We have no money. We have no insurance. You signed a waiver. But we will help you any way we can. Donate Now to the Breast Cancer Research Foundation! Order Pinkathon Gear! Deadline 10/8/18 @ Noon! 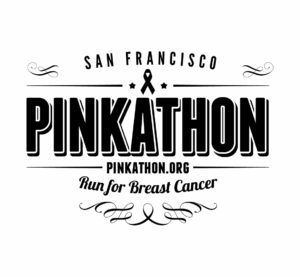 Get the latest news about Pinkathon SF!